Mozes Drukker, from Middelstum in Groningen and Juda Muller born in Meppel, married 7 April 1856 at Middelstum. They had four sons: Izaak, Andries, David and Mozes, who were all born in Amsterdam. Two of the sons came to live in Meppel: Mozes born 14 November 1886, and David born 17 November 1885. At a later date mother Juda also moved to Meppel, probably after the death of her husband. 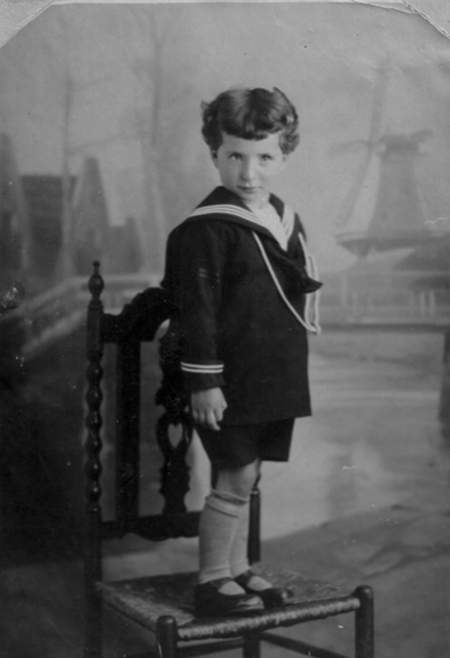 Juda died in 1938 at the age of 91. Mozes married Anna Lek (born 4 March 1888) also from Amsterdam; David married Esstella Cohen, born 27 January 1880 in Hoogeveen. David and Esstella had no children. Mozes and Anna had a son named Maurits Bernardus (born 1925), daughter Julie (born 1917) and another daughter Vogeltje (born 1920) who died only two and half months old. Maurits lived in Meppel during the War. 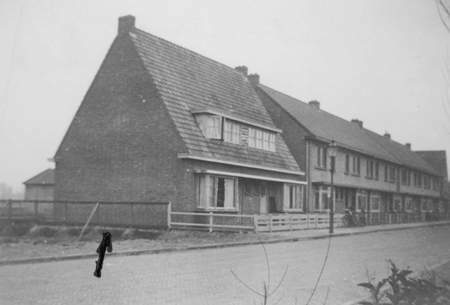 Julie worked as a domestic and moved to Amsterdam on 31 January 1942, where she came to live at Waldeck Pyrmontlaan. That was her salvation; she would be the only one of both families who survived the War. 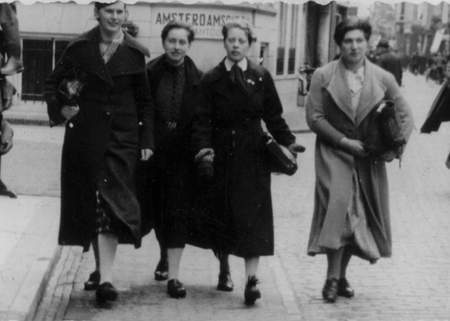 Julie Drukker (right) with friends in 1936 in the 1st Hoofdstraat. David, like many Meppel Jews had a drapery business. He had a textile shop and house in the 1st Hoofdstraat, approximately opposite Nieuwe Kerkstraat. He sold mainly underwear, socks and household textile. In 1934 he closed the business and moved to Ambonstraat. From that moment onwards he traded from his house. David had a sense of humour and was known for his many jokes. Once on a business trip he passed the butter factory at Haalweide. Suddenly he had an idea; he went to the director’s house carrying a small suitcase and introduced himself as a photographer of a well known newspaper and asked if he could take a picture of the personnel. Of course everyone was honoured and everyone put in an effort to make the photo perfect. When everyone was ready for the photograph David showed his well- proportioned bottom and disappeared really fast, followed by the disappointed personnel but to no avail. David never showed his face again around this area, it appears. On 28 July 1942, Omnia, by order of Beauftragter Seuser, liquidated David’s business. David was financially not strong and spent his whole life in rented accommodation. Every time he went to his landlord to pay the rent, he would get a cigar. Once he was ill and house- bound for a few weeks, unable to fulfil his duty. Only after four weeks, having recovered and being able to pay the rent, he was offered a cigar. Instead of taking one cigar, he took another three for he thought he was entitled to have them. In 1941 the Jewish girl Jansje de Hond came to live with David and Esstella. Jansje de Hond was born in Rotterdam on 28 April 1928. Although she was of school age, she never went to school in Meppel. 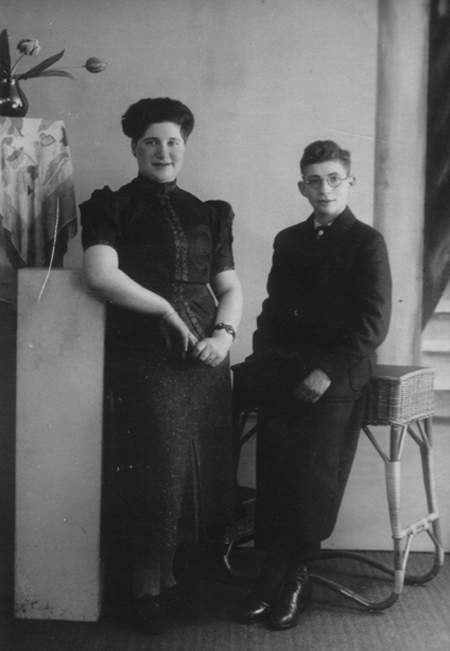 Jansje was one of many Jews who had to leave Rotterdam in 1940. On 18 November 1940 she moved to Amsterdam and later on 27 September 1941 she was added to the population register of Meppel. 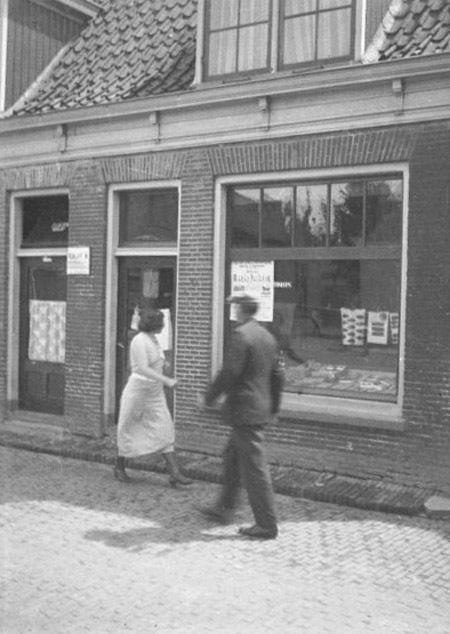 Mozes (Moos) had a small shop in fancy goods at 72 Woldstraat. He also traded in rags and old iron. Moos was a strong man; he could swing a big bag of iron waste with one hand over his shoulder and walk many kilometres with it. He would work like a slave from early morning until deep in the night but always seemed to be in a scrape (in de dalles). Nevertheless he was always in high spirits and had a great sense of humour. Before he became established at Woldstraat he lived for a while at Barentszstraat, where he once, deep in thoughts, strolled through the back door into the wrong house. Only when he reached the kitchen, he realised his fault, when he discovered the lady next door, whose husband was a clerk in the tax office, a keen angler and maybe one of the friendliest men in Meppel, sitting stark naked in a wash tub (in those days there were no showers). Both parties were heavily shocked and Moos ran off shouting ‘I did not see anything,’ ‘I did not see anything’. That is how he earned his nickname, ‘I did not see anything’. To store his goods, he had at his disposal a warehouse on the grounds belonging to the Van der Sluis family, who lived two houses away from him, at number 76. He would actually trade in everything he set his eyes on; he would even trade in empty bottles. On the 8th of June 1942 he made a statement to the police about sixty empty bottles that had been stolen. Previously (on 24 April) Moos himself was arrested, accused of stealing. He had probably laid his hands on goods which had once belonged to him, but had been confiscated by the Germans when his business was liquidated. He was held in custody at the police station until the authorization to set him free was sent by the Officer of Justice in Assen on 30 April, and he was then sent home. Wry was his humour in June 1942 at the hairdresser’s, when a few Meppel citizens asked : ‘why don’t you go into hiding Moos?’ He said he was pretty useful for the Third Reich. ‘As long as I gather kilos of iron everyday for the Führer, nothing can happen to me’, he assured them. But Moos Drukker was also too optimistic on what was going to happen to him. Maybe his last client was William Kuik, who bought, one or two days before Moos had to leave Meppel, a second hand copper lamp with inlaid glass. Kuik and his wife Lammigje Timmerman had a hotel in Noteboomstraat, not far from where Drukker had his business. In 1941, he was a young man (17 years old). He had a strong posture, dark blond hair and despite his blue eyes he looked typically Jewish. His profession was metalworker at the shipyard. At the beginning of 1942, one of the anti Jewish Regulations made it impossible for him to work. In order to have money he climbed the fence of the warehouse of Mozes Levie on the 2nd Hoofdstraat. Since the door of the warehouse was unlocked, he entered and took fl 300,- worth of textile goods and sold them in Amsterdam. Unfortunately the police found out; he was arrested and was jailed at the police station. Whether he was convicted is not known. Why I went there, I don’t know . I know for sure that in Orvelte we spoke to some of the Meppel Jews. I can still see Kats, Wolff and Drukker. They stood behind the wire fence talking to us. After a while Moos Drukker said: ‘when the War is over I will be a general’, because everyday they were drilled by a Jewish Captain from Steenwijk. Apparently Moos did well. With that he meant among other people the Meppel hairdresser Barneveld, who had not a very good reputation. On 17 August it was the turn of son Maurits Bernardus; he and many other young men from Meppel were taken to work camp Linde. Already on the 24th of August he was transported to Auschwitz, where he died on the 30th of September. He never saw his family again. On the 3rd of October, Esstella and Anna Drukker were taken out of their houses. In Westerbork they probably saw their husband for a short time. Already on 5 October both couples were transported to Auschwitz, where their lives would end on the 8th of October. Jansje de Hond, together with Estella and Anna also went to Westerbork. She probably never met any relatives in Westerbork and spent her last few days alone. Jansje died in the gas chambers at Auschwitz on the 8th of October. Maurits Bernardus and Julie Drukker in front of the lens of photographer Broekema. Only the daughter Julie survived the War. She had left Meppel and gone to Amsterdam, where she got a job in the Jewish nursing home. One day all the residents and personnel were transported to Germany. Julie managed to escape during the journey and via a contact address she came to live with a family in Limburg. There she was a farmer’s maid and was even taking part in all kinds of illegal activities until the end of the War. Julie never returned to Meppel after the War. House and shop of Moos Drukker.